For nearly three decades the U.S. Food and Drug Administration in partnership with the U.S. Department of Agriculture’s Food Safety and Inspection Service has conducted annual Food Safety Surveys to gauge and track the public’s understanding of proper food safety handling techniques. Between October 6, 2015 and January 17, 2016, the FDA surveyed 4,169 Americans ages 18 and older to learn more about consumers’ attitudes, behaviors, and knowledge of food safety. Survey results help inform the FDA’s efforts to improve consumer food safety behaviors through targeted education outreach. The survey questions are designed to measure trends in consumer food safety practices, such as hand and cutting board washing; preparing and consuming potentially risky foods; and using food thermometers. In addition to informing the FDA’s food safety education efforts, the results are used by the Healthy People 2020 initiative to track consumer food safety knowledge and actions. Food thermometer ownership rates have remained constant but usage has slightly increased – In 2016, 67% of respondents reported owning a food thermometer. Reported usage has increased for roasts, chicken parts, and hamburgers between 2006 and 2016. In 2016, 38% report that they always use a meat thermometer for roasts, compared to 19% for chicken parts, and 10% for hamburgers. After increasing between 2006 and 2010, hand washing rates have remained constant or decreased between 2010 and 2016 – We asked about hand washing at four specific times: before preparing food, after handling raw meat or poultry, after handling raw fish, and after cracking raw eggs. In all years consumers are more likely to report washing hands with soap after touching raw meat or raw fish, than before preparing food, or after cracking raw eggs. The percent who report washing with soap after touching raw meat or raw fish has remained constant since 2010 and at 85%. There was a slight decrease in the percent who report washing with soap all of the time before preparing food from 78% in 2010 to 75% in 2016. Similarly, there has been a decline in the percent who report washing with soap after cracking raw eggs from 48% in 2010 to 43% in 2016. Most consumers do not wash their hands after using handheld phones or tablets in the kitchen. About half of consumers use devices such as smartphones or tablets while preparing food, but only about a third of those report washing their hands with soap after touching the device while preparing food. This is a new finding and points to the need for additional research to better understand how technology is used in the kitchen. As the holiday season unfolds and we prepare feasts for family and friends, make food safety a priority. 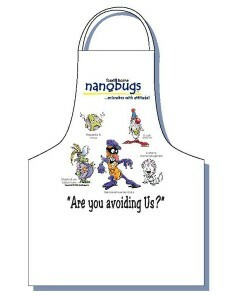 Let the nanobugs help you engage and educate people of all ages to learn more practical microbiology and improve compliance with effective infection prevention behaviors.